Following a wildly successful world premiere in December 2016, The Joffrey Ballet will present its newly reimagined holiday classic The Nutcracker by Tony Award®-winning choreographer Christopher Wheeldon in 33 performances only, at the historic Auditorium Theatre of Roosevelt University in downtown Chicago at 50 East Congress Parkway, December 1-30, 2017. A ballet in two acts, The Nutcracker opens in Chicago on Christmas Eve, 1892, mere months before the opening of the World’s Columbian Exposition of 1893, also known as the World’s Fair, a marvel unlike anything the city has ever seen. Marie and her younger brother Franz arrive at home, where their immigrant mother—a sculptress of modest means—designs the seminal masterpiece that will preside over the Fair. A festive Christmas potluck ensues, only to be interrupted by the mysterious Great Impresario, creator of the World’s Fair. He entertains with enchanting visions of the what’s to come, distributing gifts in the process, which includes a mercurial nutcracker for Marie. That evening, Marie awakens to an epic battle between toy soldiers and rats led by The Rat King and the now life-size Nutcracker. Unexpectedly, Marie saves the day, as The Great Impresario and the Nutcracker, now transformed into a Prince, set sail on a magical journey into the night. The second act begins as the trio arrives on the shores of the fairgrounds, greeted by the Queen of the Fair, who grants them a dream-like visit among the sprawling attractions. They move from pavilion to pavilion, represented by countries from around the world. As the dream ends, the Fair explodes with light and Marie suddenly awakens to find it is Christmas Day. The Chicago Philharmonic, led by Joffrey Music Director Scott Speck, provides live accompaniment of the classic score by Peter Ilyich Tchaikovsky for every performance. The full Joffrey company is also joined onstage by over 90 young dancers from the Chicagoland area and young vocalists from four different local children’s choirs. The Nutcracker features design by an award-winning creative team, including Tony Award®-nominated set and costume designer Julian Crouch (Hedwig and the Angry Inch, Shockheaded Peter), Caldecott Medal Award-winning author and illustrator Brian Selznick (author of the New York Times bestseller Wonderstruck, adapted into the film of the same name starring Julianne Moore, which just received its critically acclaimed U.S. release), Obie and Drama Desk award-winning puppeteer and MacArthur Fellowship recipient Basil Twist (The Addams Family), six-time Tony Award®-winning lighting designer Natasha Katz (An American in Paris, Frozen) and Tony Award®-winning projection designer Ben Pearcy (An American in Paris, Hedwig and the Angry Inch). 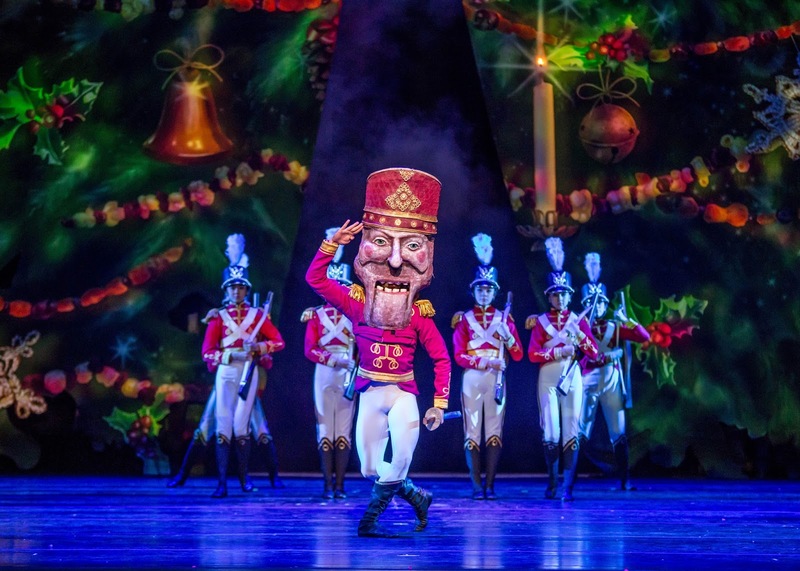 The Joffrey Ballet performs The Nutcracker Friday, December 1 through Saturday, December 30. The full schedule is as follows: Friday, Dec. 1 at 7:00pm, Saturday, Dec. 2 at 2:00pm and 7:00pm, Sunday, Dec. 3 at 2:00pm and 7:00pm, Thursday, Dec. 7 at 7:00pm, Friday, Dec. 8 at 7:00pm, Saturday, Dec. 9 at 2:00pm and 7:00pm, Sunday, Dec. 10 at 2:00pm and 7:00pm, Thursday, Dec. 14 at 7:00pm, Friday, Dec. 15 at 7:00pm, Saturday, Dec. 16 at 2:00pm and 7:00pm, Sunday, Dec. 17 at 2:00pm and 7:00pm, Wednesday, Dec. 20 at 7:00pm, Thursday, Dec. 21 at 2:00pm and 7:00pm, Friday, Dec. 22 at 2:00pm and 7:00pm, Saturday, Dec. 23 at 2:00pm and 7:00pm, Sunday, Dec. 24 at 2:00pm, Tuesday, Dec. 26 at 2:00pm and 7:00pm, Wednesday, Dec. 27 at 2:00pm, Thursday, Dec. 28 at 2:00pm and 7:00pm, Friday, Dec. 29 at 2:00pm and 7:00pm, Saturday, Dec 30 at 2:00pm. Single tickets, which range from $35 - $165, are available for purchase at The Joffrey Ballet’s official Box Office located in the lobby of Joffrey Tower, 10 E. Randolph Street, as well as the Auditorium Theatre of Roosevelt University Box Office, by telephone at 312.386.8905, or online at Joffrey.org. The company’s commitment to accessibility is met through an extensive touring schedule, an innovative and highly effective education program including the much-lauded Academy of Dance, Official School of The Joffrey Ballet, Community Engagement programs and collaborations with myriad other visual and performing arts organizations. The Joffrey Ballet gratefully acknowledges the generous support of 2017 The Nutcracker Production Sponsor Jewell Events Catering. Also with gratitude to The Nutcracker Commissioning Sponsors Margot and Josef Lakonishok, Searle Funds at The Chicago Community Trust, Hancher Auditorium - University of Iowa, and the many “Believers” including Corporate Sponsors Blue Cross and Blue Shield of Illinois, Gallagher, BrickStreet Insurance, Guarantee Trust Life Insurance Company, and Sponsors Mary Jo and Doug Basler, Rosemarie and Dean Buntrock, Sandy and Roger Deromedi, Pamella Roland DeVos and Daniel DeVos, Sonia Florian, The Walter E. Heller Foundation, the Auditorium Theatre of Roosevelt University, Bruce Sagan and Bette Cerf Hill, Bill and Orli Staley Foundation, and the Women’s Board of The Joffrey Ballet. Special thanks to Co-Sponsors of the 2017-2018 Season: Abbott Fund, Alphawood Foundation Chicago, NIB Foundation, Daniel and Pamella DeVos Foundation, Live Music Sponsor the Marina and Arnold Tatar Fund for Live Music, and Season Partners: pamella roland and Fox Ford Lincoln, Clear Channel Airports, and JW Marriott.